In Wind Raven, when Nick and Tara dined in Bermuda in the home of the Albouys in the summer of 1817, they were served a special syllabub for dessert. Now you can make the dessert they ate in Wind Raven for yourself...here's the recipe! 1. Mix the mango jam and rum together until smooth. 2. Whip the cream until it forms soft peaks, then add the sugar and whip again. 3. Fold the mango and rum mixture gently into the whipped cream. 5. Chill until ready. 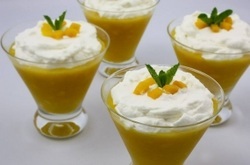 Garnish with whipped cream, chopped fresh mango and grated nutmeg. Serves six.